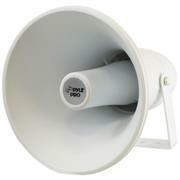 This 9.4' indoor/outdoor horn speaker is great for your 70 V audio system. Perfect for outdoor PA systems when you need your sound heard far and wide. This 30 watt speaker includes a 70 V transformer tappable at 30, 15, 7.5, and 3.5 watts. Includes mounting bracket and hardware for easy installation. Let your voice be heard with the Pyle 9.4'' Indoor/Outdoor 70 Volt PA Horn Speaker.